Little did I know, in tipping up a bunch of losers for Alex’s trip to Newmarket last Saturday, that I’d be there myself. Mrs A had a proper birthday treat in store for me: only a trip to Newmarket Races (the posh enclosure, mind!) and a sleepover in a rather lovely little B&B tucked away in the side streets. I’d never been to the Rowley Mile course before. 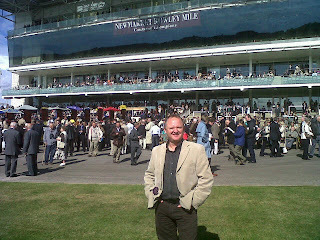 I’ve been to the July course at the other end of the same track a couple of times. But not to the home of the season’s first two classics and a host of other top class races. Small kerfuffle in trying to get in. We had tickets for the 17th but the badges accompanying them were wrong. They were for the Cambridgeshire meeting next week. I’d have been happy to come then as well, but sadly, officialdom insisted we must have the correct purple ones instead. But look at me, look at me. I’m at the home of racing! That’s Eclipse that is. (The one on the left). Legendary sire. Spawn of the Gods. 80% of modern day racehorses can be traced back to his fertile loins. I learned this at the National Horse racing museum the next day. More of this later. We were quite enjoying smooching around this well-appointed venue. This is one of the track’s lower profile fixtures, so we didn’t have to elbow hordes of people out of the way to sample the atmosphere from the top of the Millennium Bar and Lounge, in the Birdcage Bar, from the head-on stand, in the Paddock Bar…. Don’t get the wrong impression. Considering we were celebrating, I think Mrs A and I were actually quite restrained in our alcohol consumption. A few red ones and dark ones to soften the blows of repeated losers, certainly. But you know, it could have been much messier. Not that the inconsistent drinks policy helped. From the premier enclosure we were forcibly stripped of our drinks before being allowed outside (OK, maybe it was more of a civilised reminder…) Later on, pure farce. 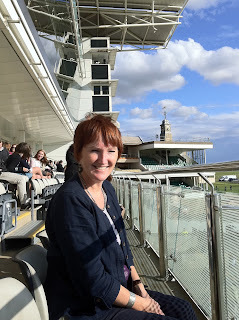 I was drinking a frothy cappuccino (oh yes, I can appear sophisticated when in the mood) and was moving from the grandstand back to the premier enclosure when I was stopped at the entrance and asked to put a lid on my drink! WTF (as common parlance has it)? Lidless coffees are not acceptable in the posh end? But a minor quibble. No more than that. Of greater concern was our startling absence of winners. It was my birthday. You’d have thought he horses would oblige really. No winners in the first three races. Although Mrs A did change her mind about one that then won. Never change your mind. Everyone knows that…..
No close finishes and no trail-blazing leaders. I was starting to get nervous in case I bumped into Alex. Surely he wouldn’t have taken my tips literally? Mind you, Julie did. 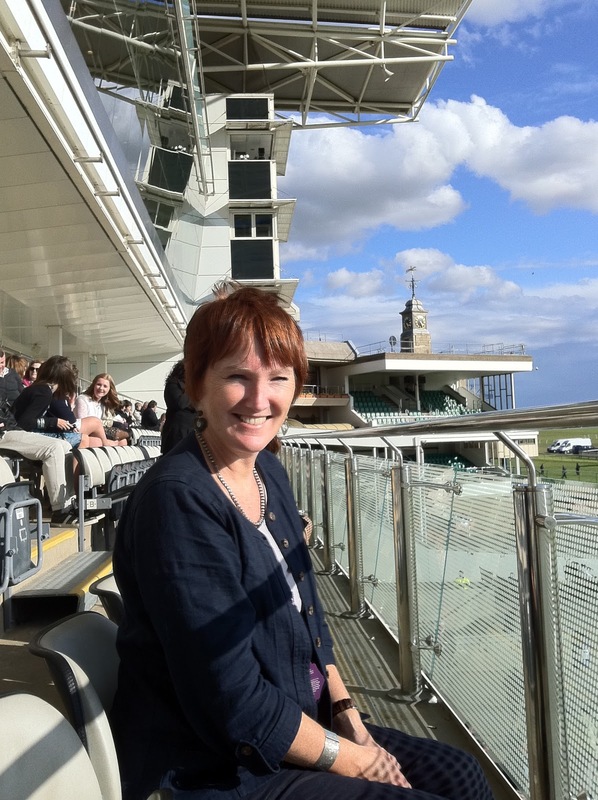 Her book-group was enjoying stunning views over the winning post at Newbury from their box. I know because she sent us a picture. She was also texting us winners she’s backed that I’d mentioned to her, albeit vaguely, in my dispatches. Do they count as bona fide tips? I’m getting desperate! Our view over the track was pretty good too. Looking back to the straight mile start, it looked like a pretty much down hill track. Until it sank into, then rose from the notorious ‘dip’ in the final two furlongs, cutting through the track like a fault-line across the heath. The straight is actually 1m2 furlongs and the track is named after Old Rowley, a favourite hack of Charles II who used to watch the races from the bushes that we could still see about a furlong from the finish. I found this out at the National Horse racing museum the next day. But more of that later…. Finally I roared home a winner! Qushchi landed the spoils at 5-1 with a perfectly timed run up the rail. This in a race where the tip I gave Alex was a non-runner. He’s never going to believe me is he? Then Mrs A skins the bookies in the lucky last! But what style! Caution to the wind saw her select two fancies for this sprint handicap. One of them, Murura fairly romped up, his jockey looking assured and stylish in the plate. 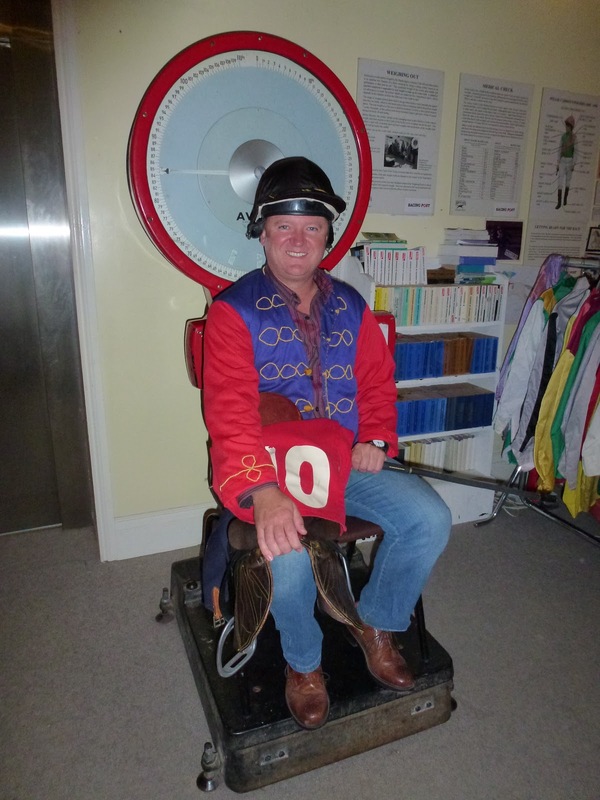 Something else I was to pick up later at the horseracing museum…..We stopped by the paddock to cheer them into the winner’s enclosure. Let’s hear it for symmetry. Our winners almost exactly paid for the day’s punting. No more, no less. There’s plenty of sad occasions at less salubrious fixtures when I’d have killed for such a result. The track is close enough to the town to walk back. And so we did. Across the gallops used daily by powerful yards in the Newmarket area and over Hamilton Road, one of the many training nerve centres in the town. The place simply drips with racing connections. The sport is its lifeblood. Of 20-odd thousand residents, almost 5,000 owe their living to various aspects of the racing industry. (Thanks due, again, to that racing museum.) Even our B&B hosts are former jockeys and trainers. I checked out Conrad Allen’s training record. Whilst there’s nothing much very spectacular there, he did win over £100 grand in prize money in a couple of seasons and was active for nearly 15 years. It was a cosy B&B. And there we were without the kids. Well it wasn’t long before the earth was moving. Oh yes. Quite literally. A juddering thunderstorm broke over the house, rattling the blinds and blowing the curtains in. We had been incredibly lucky with the weather all day. Our luck held again because half an hour later we were back out in the dry, heading for a Turkish restaurant at the top of the High Street. The grub could not be faulted. Nor the service. And there was a nice big telly over the bar, too. I’d been looking at it on and off for about 10 minutes before I realised this dull and slow moving drama set in a large, sterile kitchen was actually the back room of the restaurant where we could see our kebabs being prepared. There was still time for a post-meal drink and we were on the look-out for a comfortable little establishment in which to unwind for a while. The wine bar attached to the Rutland Arms looked more appealing than a when full of diners a couple of hours ago, so in we went. Empty, save for a couple of ladies over by the window, leaving a choice of plump sofas for us. I left Mrs A at the bar ordering my G&T whilst I went to loo. By the time I returned, she was involved in a complicated transaction for a bottle of Rioja with one of the ladies we’d seen on our arrival. The other shouted out ‘Happy Birthday’ in jolly tones from the other end of the room. I’d only been gone a minute. Tash and Sarah had also been at the races today. It had been a spur of the moment decision to come up from London. They were a scream; a gregarious double act mixing enthusiasm, exuberance, airy confidence and riotous humour. We spent a fun couple of hours chatting about racing, music, food, jobs, men (I took a back seat on this one) and Lord knows what else over a few drinks, injecting a bit of life into the moribund hotel. We inhabit different worlds, but we parted the best of friends and staggered home. After the traditional B&B full English (7/10 – no beans, no black pudding), we set off to the explore the town. Top of the list was the National Horse Racing Museum. This was a bit of exploitative birthday opportunism. I couldn’t really see Mrs A getting much out of this. Infact, we both loved it. From fascinating nuggets of info (as I’ve already displayed), stories and features through to art, costumes and exhibitions. Easily the highlight was ex-jockey Bill’s stewardship of the practical workshop. Bill, now 78 years old, was sporting braces on both arms, a number of false and had enough pins, screws and plates in his body to arm to keep airport security on full alert. Medical opinion had finally forced him out of the saddle at 72. On his retirement he had the honour of a race at Newmarket named after him. So he’s here now. Demonstrating to tourists and schools the various saddles, bits, feed and grooming that make up the training regime. And there’s also a horse simulator. Well, I couldn’t resist this. Crank it up my son. I can take it! Look at that style. I tell you I’m an absolute natural! Bill was cranking that handle up to 11 on the Spinal Tap scale as well. “Are we near the finish line?” I breathlessly uttered, thighs burning like the coals on last night’s griddle. “You’ve just left the parade ring at a canter!” The man’s a wind up merchant. Newmarket the town is a strange old mix. 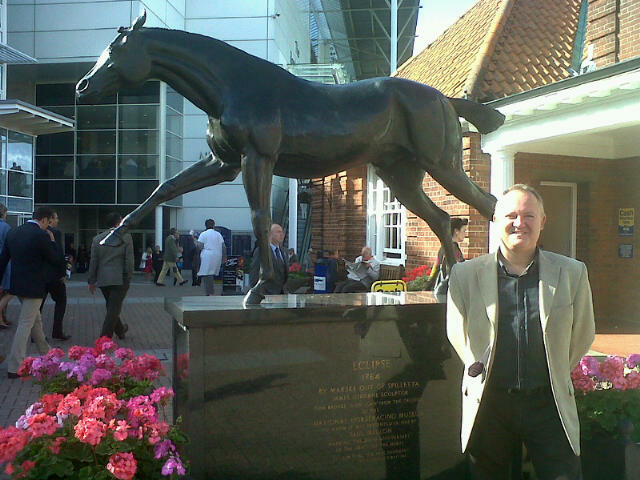 There are plenty of other places with strong racing connections – Middleham, Malton and Cheltenham spring to mind. But I’ve never been anywhere that has racing etched into the very shape of the town. Two racecourses on the outskirts, extensive gallops enclosing the northern-eastern and southern-western approaches, strings of stables and studs right through the spine of the town; an equine hospital; farriers, feed merchants, saddlers and tack shops; a sales ring; and, I swear, every pub name has a horse connection. There are some fine buildings: the Jockey Club’s Georgian pile, Palace House and stables (currently being restored), even the horseracing museum. And yet I was expecting a bit more grandeur and affluence. A bit less car-crash 1970’s architecture. There was just time to linger over a (so-called) coffee (“This is possibly the worst instant dregs I’ve ever drunk”,) in the beautiful and unexpected late morning sunshine. Crap coffee in the "& Horses"
Then we left. En route, we stumbled upon the grandeur and affluence that I thought was absent. We crossed the famous Severals and Limekilns gallops and drove along Bury Road, gawping at mansion house after mansion house with associated acres of training facilities. Wide-eyed, I pointed out to Mrs A the brass lettering for Freemason’s Lodge, Sir Michael Stoute’s base, affixed to a rather impressive gatepost and Godolphin’s massive spread at the end of the road. She feigned mild interest, but I think she was at racing saturation point by now. I’m not complaining. That was a fantastic weekend and a great birthday present. How do I return the compliment come April?